GRAY — Maine-Tex grilled salsa has a new permanent home at Maine-Tex Bistro in Gray, which celebrated its grand opening Jan. 26. Windham resident Stephanie Lay and her severely autistic son Bryce began making grilled salsa out of their home in 2014. It was so popular that it took mere months for the salsa to end up on the shelves of a Hannaford. Since then, business has boomed. Now she’s also selling breakfast and lunch fare, including burritos and breakfast quiche, at the bistro at 81A W. Gray Road. The salsa is made of grilled tomatoes, onions, peppers and a secret mix of spices, a recipe Lay created while living in her home state of Texas. Lay started teaching Bryce — who was diagnosed with severe autism when he was 2 — how to cook when he was 7. “If I die, my son is by himself, he’s on his own. I just wanted him to be able to take care of himself and at least feed himself,” she said. “From then to now, strides. It’s a family trait, we’re both hard headed and we’re both not going to give up,” she said. Lay also founded a 501(3)c nonprofit organization called SPECIAL Foundation for Autism, which stands for Special Parents Establishing Connections in Autism Lives. A portion of all proceeds at Maine-Tex goes toward supporting the foundation. The organization is her way “of using her personal experiences to help other parents navigate through the challenging world of autism,” according to its website. SPECIAL aims to establish a work program for individuals on the spectrum to work at Maine-Tex. Lay said her goal is that 80 percent of their staff will be on the spectrum. Those with autism have an extraordinarily high rate of unemployment. Meanwhile, business continues to grow. Maine-Tex recently installed an indoor grill and Lay is hoping to build two greenhouses so that they can grow their own produce. She hired two additional employees. Maine-Tex is also a semifinalist on GreenLight Maine, a television show that promotes businesses with a $100,000 grand prize. “The coolest thing is having our house back. Before, it was salsa everywhere and jars everywhere. Now, it’s all here and organized,” Lay said. 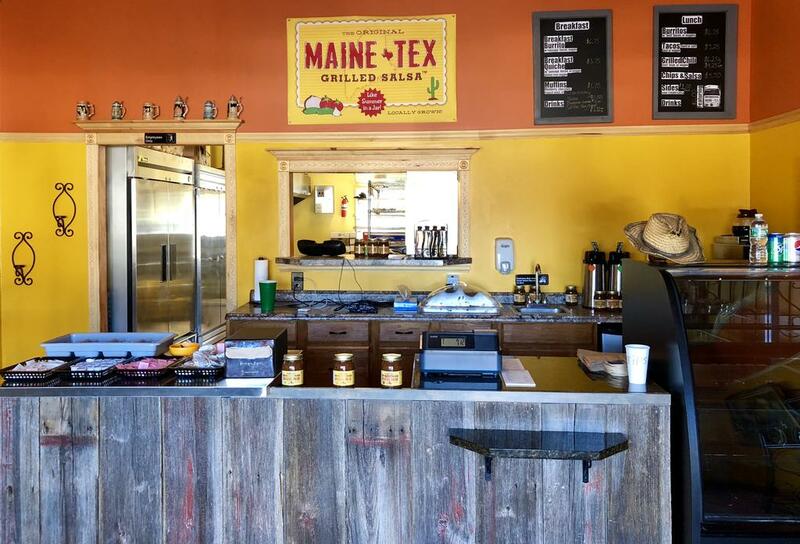 Maine-Tex Bistro recently opened at 81A W Gray Road in Gray. Stephanie Lay prepares her salsa.